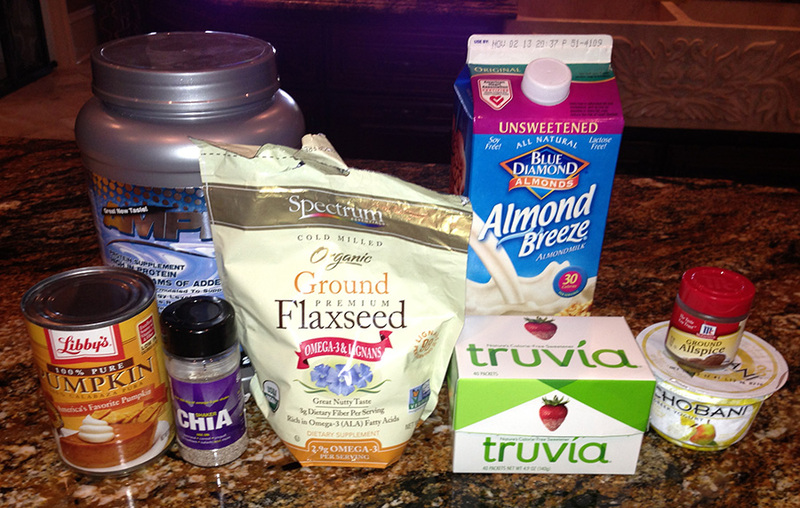 Fall is here and I love anything pumpkin so I decided why not make a protein shake with pumpkin puree after my workout. Pumpkin puree that you get in the can (NOT pumpkin pie filling that’s filled with sugar) has 300% of your daily value of Vitamin A, only 40 calories per serving, 1/2 grams of fat and is low in sugar and carbs! Also, I wanted to use Greek yogurt in the recipe for extra protein and for the consistency. I had Chobani Greek Yogurt in pear flavor and at first I was just going to use the plain yogurt on top but I mixed it up and found that pear went really well with the pumpkin. But just in case feel free to use plain Greek yogurt. I use a Nutri-Bullet to blend it all up but make sure you add the protein powder and seeds last if you are using the same so it doesn’t get stuck in the bottom of the cup. Toss all the ingredients in, blend and enjoy!